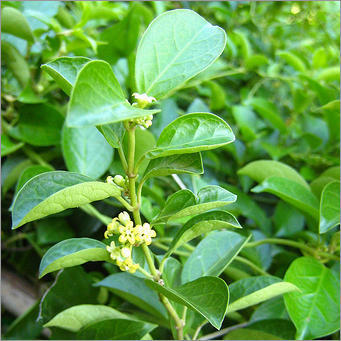 Pioneers in the industry, we offer gymnema sylvestra extract from India. Gymnema Sylvestre also known as Gymnema rattan, Morinda, Smilax, the Department of Asclepiadaceae plants. Gymnema extract is mainly composed of triterpenoid saponins, glycosides, flower pigments, polysaccharides and other constituents. The extract has hypoglycemic, lipid-lowering and anti-platelet aggregation activation. Its leaves are used to regulate traditional Chinese medicine, on its leaves chewed up, would interfere with sweet taste, its Hindi as Gurmar, interpreted as sugar killer. In the past, the root of vine Gymnema is also often used to treat snake venom, constipation, Yang Wei, maintain moisture and liver disease. Vine Gymnema acid receptor molecule can cover one to two hours, thus inhibiting the food taste buds of the sugar molecules in the active. Looking for “Gymnema Sylvestra Extracts”?